Based on the movie from DreamWorks Animation about a garden snail who longs to become the fastest racer in the world, Turbo: Super Stunt Squad for 3DS is yet another licensed title that suffers from a lack of working controls, solid visuals and compelling gameplay. 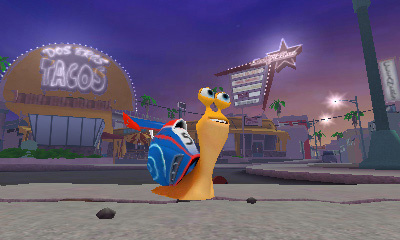 While D3Publisher and developer Torus Games have the right idea — what better way to adapt a movie about racing snails than to create a Mario Kart clone? — the experience falls flat in too many areas to recommend at full price to anyone other than non-critical kids, who will enjoy it for a few hours after seeing the film. 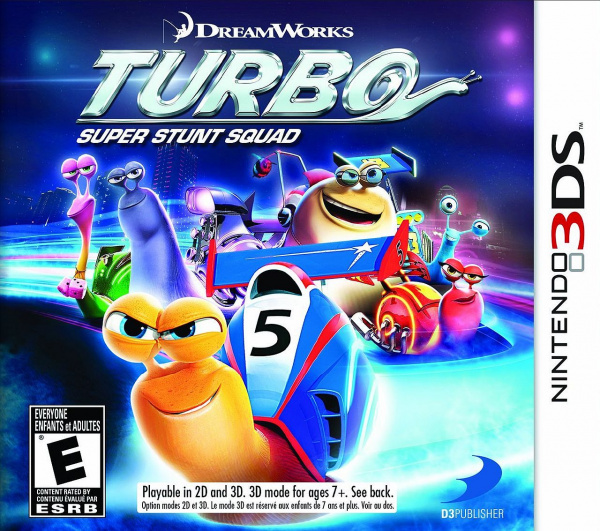 Turbo: Super Stunt Squad is structured like Mario Kart or any other kart racer, but without any context. Anyone playing the game who hasn't seen the film won't get much here, as there is no story mode to be found; character biographies or profiles would have been nice, at the very least. There are very few characters to choose from, so a little background would have gone a long way, especially since the only bits of personality we get from the snails come from annoying, frequently repeated one-liners that make little sense. The presentation is poor across the board. The visuals suffer from bland colours and a lack of attention to detail, and when there are more than two things happening at the same time on-screen the frame-rate suffers from slowdown, which is unacceptable given how bland and dull the graphics are. The 3D effect, meanwhile, is best turned off; it's nowhere to be found when going through menus between races, and gives the tracks very little depth during the action. As for the music — the generic racer fare makes for forgettable listening. There are three cups to complete, with different tracks and slightly more challenging difficulty levels as you progress. Unfortunately, the challenge found in Turbo: Super Stunt Squad comes not from tricky tracks or competitor AI, but from frustrating controls and tedious gameplay. Though it controls like any other racing title would, with buttons to accelerate, slow down, and the D-pad to perform "stunts," it's nearly impossible to make a turn gracefully, even when drifting. There is a constant feeling of not having a handle on the characters, and a "respawn" button is available for when racers go off the rails into the abyss (which happens all too often). 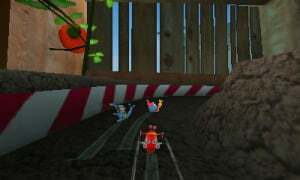 The tracks themselves are cleverly designed, taking place in mundane areas that are oversized to a snail, like a taco restaurant, often going from the floor to the wall to the ceiling. It's too bad, then, that the lack of visual flourish makes the tracks hard to distinguish from one another and the funny, unique areas hard to notice. Perhaps the most egregious and confounding misstep Turbo: Super Stunt Squad takes is that it completely fails to deliver on its title — there are only four "stunts" to perform, and they're mapped to the D-Pad when going over a ramp. Pressing one D-Pad direction produces a tomato that enlarges the player's snail for a short time; another does a backflip that leaves the snail with a boost item; another provides three protective "taco shells;" and one gives the player a salt/pepper shaker to throw off competitors. The only purpose of these "stunts," then, is to give the player power-ups. There are no combinations, and while it is possible to stack the same item twice or more, there's really no difference. 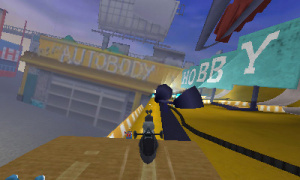 And all the playable racers have the same stunts without any distinguishing characteristic or ability. Even more disappointing is that there are no variations on the four power-ups; you won't be punting a spiked taco shell at anyone. There are a sprinkling of extras to be found. In addition to the three cups, there are other modes designed to keep the player's attention, such as reversed courses, time trials and quick races; each of the racers also has several different shells that have different handling to switch up the gameplay a bit. 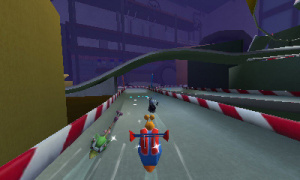 There is no multiplayer mode, online or local, which severely limits the replay value of a kart racer. When licensed titles are developed with more love and care — see the potential of Disney Infinity and some others from studios such as WayForward — it's difficult to play a rushed and dull product like this one. It's destined for the bargain bin once the movie is out of theaters, and there are simply too many good racing titles out there to warrant a purchase. Players are advised to steer clear and spend their time and money elsewhere. xD This is a laugh! I wish movie games stop being made, wasting resources on bad games. As expected from a movie license game, as always. But when i look at these screens i start to wonder: Are they even trying ? It looks like a freeware game from the early 2000s. It may be not the biggest bombast game developed, but it certainly cost money. Why do these companys flush these amounts of money down the drain instaed of investing it in something worthwhile ? Another day, another bad movie game. Not surprised. Yet another movie gets a bad score. Nothing surprising here. Not so Turbotastic, it seems. There should be 1 or 2 companies that make all the licensed film tie in games. All they should focus on is making every one of those games at least decent. That's not too much to ask. It could be done, and they would sell better. Should have given this to the team that made the Speed Racer game, that game was the best racing movie tie-in game ever. Knew it. Racing game trying to compare to Mario Kart 7? Sorry but not happening. Good review though. Given the fairly constant low rate of quality these games have, why does Nintendo Life always review them? I don't think anyone on this site saw this game and thought, "Wow. That looks like a game I'd like to spend my money on!" @Le_Wario26: There's people wanting to buy all sorts of things. Even if some things don't sparkle your personal interest, you can be sure that at least one person will be interested in them. Oh wow lawl I read the title and just thought this was some random shovelware, not a movie tie-in. You know, when I first heard the title of this film, I thought that it was going to be a WIR spin-off. @sinalefa I guess you could say it's Turbo-Terrible? Turbo-Trashtic? Wow, a crappy movie license game. Big surprise there! @retro_player_22 I agree, Speed Racer was awesome! For some reason, I imagined this being kind of like tony hawks pro skater. Which considering the movies plot, was kinda dumb of me. Not all movie based games were bad. For example, I LOVED The Incredibles for the Gamecube, it was my favourite game and it was a huge inspiration to me. I kinda liked Friday the 13th, it was like Resident Evil back then. I remember when movie video games used to be good :/ Lion King SNES anyone?! @redsoul91 What about Aladdin and Super Star Wars? Those were great! The graphics look like I could have made them. And I've just started learning how to make 3D graphics. If they had told me to make all the 3D models for them, and given me a time-frame to do it in that was not long enough for me to learn how to make better models and/or textures, this is how it would have turned out. why why why why why WHY? Nintendo, what's wrong with you? No, not all movie based games are bad. Batman/Star wars/Lord of the rings/Goldeneye and many more are just quality top releases. As of yesterday, there were no player posts on Miiverse for the Wii U version from the PAL side of things anyway. It made me giggle a little. And then feel sad. @TheAdza I was just about to say the same thing, at least it shows Wii U owners have taste. @Morphtorok yes nintendo. Why do they allow this to be published. Doesn't surprise me. Usally games based on movies are bad. Like E.T.